What's more impressive: James Harden's 30-point games streak or Russell Westbrook's triple-double streak? In the last few weeks, two of the NBA's best players started their own streaks. The two streaks are entirely different, but they are breaking records. The streaks are becoming historic and will be difficult to replicate. 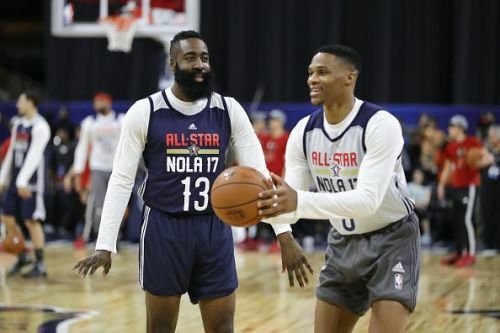 The streaks belong to former teammates James Harden and Russell Westbrook. On Wednesday, James Harden scored 42 points in a loss against the Minnesota Timberwolves. This lead to his 31st consecutive 30-point game. His performance against the Wolves helped Harden tie Wilt Chamberlain with the second-longest streak in NBA history. Chamberlain scored 30 or more points in 1962, which was the second-longest streak before James Harden. Chamberlain's streak in 1962 came after his streak of 65 consecutive 30-point games from November 4, 1961 – February 22, 1962. His 65-straight 30-point games is the most in NBA history. Harden currently has 31-straight 30 point games. His accomplishment is impressive, but he still needs 34 consecutive 30-point games to tie Chamberlain's 65. The Rockets have 25 games left this season. Even if Harden is unable to reach Chamberlain, his streak is still impressive. James Harden has been impressive all season. His season is MVP worthy. His 30-point game streak started with one of his best games. On December 13, Harden scored 50 points against the Lakers. He had a 50-point triple-double with 50 points, 11 assists, and 10 rebounds. Two days later, Harden had another triple-double with 32 points, 12 rebounds, and 10 assists. He continued his scoring rampage throughout the rest of December. On January 23, Harden had a remarkable game against the New York Knicks. He scored 61 points that game, which is the second highest points scored at Madison Square Garden. Carmelo Anthony still holds the record with 62. Harden's January was even more impressive than his December. In January, he averaged 43.6 points, 8.7 rebounds, and 7.6 assists. Overall, Harden averages 36.6 points, 7.7 rebounds, and 6.7 assists this season. His season has been fun to watch and it is breaking records. But, he isn't the only one. Russell Westbrook has a streak of his own. On Thursday, Russell Westbrook had his 11th triple-double with 44 points, 14 rebounds, and 11 assists. He also became the all-time leading for the Oklahoma City Thunder that night. He passed Gary Payton by scoring 18,247 career points. Recently, Westbrook broke a record held by Wilt Chamberlain. Chamberlain had the most consecutive triple-doubles in a season with nine. Westbrook surpassed him with 11. Both Harden's and Westbrook's accomplishments involve Chamberlain, who accomplished great things in his career. This season, Westbrook averages 21.7 points, 11.2 assists, and 11.2 rebounds. If continues, to average a triple-double, this will be his third consecutive season averaging a triple-double. His first triple-double season was in 2016-2017. He averaged 31.6 points, 10.7 rebounds, and 10.4 assists. He won the MVP award that year and surpassed Oscar Robertson for most triple-doubles in a season. Westbrook had 42 triple-doubles that year. Russell Westbrook has a knack for triple-doubles and this year is no exception. His streak of triple-doubles could continue after All-Star break. Harden and Westbrook are accomplishing great things this season. A large streak of 30-point games and consecutive triple-doubles are extremely difficult. As of now, Westbrook's triple-doubles are a bit more impressive. Harden also has triple-doubles this season but it hard to get triple-double repeatedly. Westbrook has 11 consecutive triple-doubles. Regardless, both feats are impressive and historic. Fans should enjoy them while they can.